Paper or plastic? While our grandparents were never asked this question, the evolution of single use items and containers has brought the cost-efficient, mysterious plastic bag into virtually every corner of our lives. In Bag It, Jeb Berrier, talk radio personality and modest “average Joe”, voyages into the world of plastics examining the single-use conundrum, marine contamination, corporate interference-to-progress and the truth behind recycling. He also learns first hand the impact of BPA and Phthalates on human beings just in time for the news of his wife’s pregnancy. Although the film is full of shocking statistics and uncovered facts, it, by no means, ends with a “doom and gloom” sentiment. If anything, the film is a prime example of how each of us has the ability to grab truth by the horns and demand change. Opportunity Green: Can you tell us a little of the back-story behind the film? About how you were connected with Jeb? 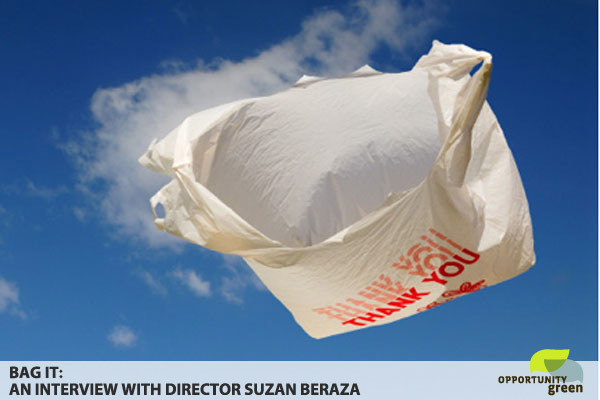 Suzan Beraza: I knew I needed someone who was not afraid in front of the camera. I met Jeb in the theatre industry and I directed him in several shows and improv. He wasn’t an activist at first, but he has definitely changed. OG: How long did the movie take to develop from thought to premiere? SB: It took two years. Started in June of ’08. Our first pre-screening was at the Ashland Film Festival (AFF) in May of last year. 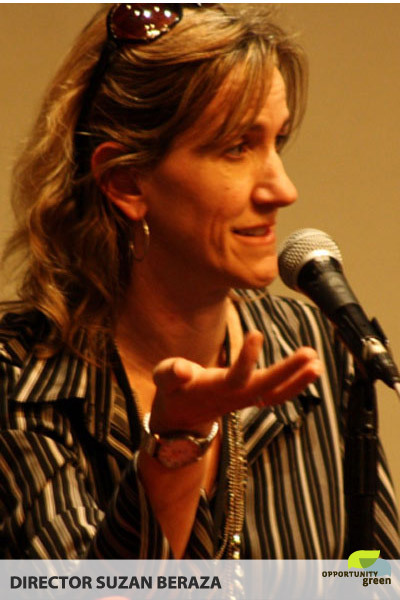 OG: What has your response been regarding the film since the Wild and Scenic Film Festival (WSFF)? SB: Very good – we were shocked as we won the Audience Choice Award at the AFF. We were runner up to Audience Choice at the WSFF. OG: The film truly covers a wide-scope of potential viewers. Has the film been praised or invited for screenings in any unforeseen or unique environments? SB: Yes, we have had a lot of interest from churches, synagogues and also schools. OG: With the American Chemistry Council (ACC) spending enormous amounts of money to campaign for keeping plastics in cities (i.e., $1.4 million in Seattle), what is it going to take to tackle the beast in our own cities? SB: I think it’s going to take momentum from people. Seattle[’s ban] was started by the City Council, however, while that was great, people need to be behind the movement to overcome the resistance. OG: What is your advice for the “everyman” who wants to take action but might be overwhelmed by the wasteful current they come up against? SB: You obviously have to choose your battles and I hope that the tone of the film is that there is promise and hope. Hopefully people will start small by bringing their own containers/bags. Once you do that one thing it opens the door and you see all of these other things you can do in your life to conserve. OG: The Great Pacific Garbage Patch, is a huge problem. With a 40:1 plastic-to-food ratio, we are killing the livability of our oceans. Do you feel that projects such as Bag It can have a large enough impact to turn the tide? What role can cities and NGOs play in curbing our run-off pollution management? SB: I think it’s going to take efforts on all fronts. It’s really going to be an all out battle. Film projects are a great way to at least raise awareness, but now starting to make sure we don’t put anything else into the ocean will take a multi-pronged effort from all stakeholders. ‘BYOB’ won’t solve the problem on its own. It is something that we have to do, it’s our responsibility, it’s not fair for us to jeopardize the livelihood of already endangered species. OG: What can worried parents do to protect their children from BPA and Phthalates? Any resources that are great for checking products on the shelf or should they just assume the chemicals are present unless they see BPA- or Phthalate-free? SB: It starts with pregnancy. Even when you are trying to get pregnant, avoid canned food or drinks and a lot of personal care products. Skin Deep is a great resource as well as Safe Mama. When I was pregnant, I was only trying to pay attention to food, I wasn’t paying attention to my skin — the largest organ on my body. It’s a process of learning more about BPA and Phthalates. You should be able to recognize the ingredients of products you are using and putting in/on you or your child. Really, glass and stainless steel [containers] are the best way to go. OG: What do you think about LA’s current fee-based incentive to not use plastic bags? Is 10 cents per bag a large enough incentive? SB: Things without value, we tend to not afford any thought or interest. Washington D.C. had a major shift, millions of millions of bags in the first year with only a 5 cent increase. I think psychologically people just don’t want to pay. (87% reduction in one year according to EWG 22.5 to 3 million with a 5 cent increase). OG: Other than the Whole Foods’ “Do Something Reel” Campaign, are there any other campaigns in the works to spread the film’s exposure? Dreams of Sundance? National Broadcasts? SB: We are currently on National Public Television. 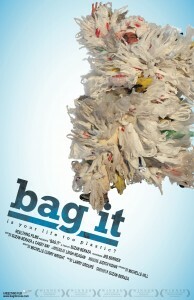 Go to www.bagitmovie.com to find screenings and broadcast screenings (PBS and public television affiliates). OG: You have an impressive history of environmental film making, are there any other projects in the works that you are at liberty to touch on? SB: Yes, our company has started work on a documentary film concerning a proposed uranium plant – the first one proposed in the last 25 years in the area. The film compares local opinions concerning economic and environmental issues. We just started filming yesterday. OG: With broad-reaching films like Bag It, what kind of social impact do you expect to ignite? SB: I hope to see a real sense of awareness and inspiration for people to take action in their own lives. That is sort of what is lacking in our society, we have so much power that we are not utilizing.” It seems that government is often slow to change unless the people demand reform. As more people ‘kick and scream’ about issues, true democracy starts to show it’s face. Excellent interview. I think Suzan Beraza is totally right. Her suggestion and speech are obviously helpful and praiseworthy. Thank you to share this interview.